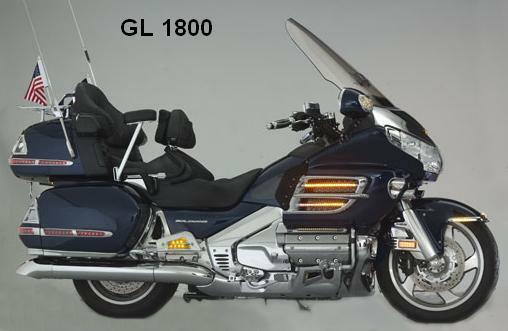 Enter the all-new GL1800 Gold Wing, a completely-redesigned-from-the-tires-up showcase of Honda engineering and styling. Featuring a massive new 1832cc flat six engine and lightweight aluminum frame, this new-generation giant is as powerful as it is agile. Optional Anti-Lock Brakes (ABS) merely upped an already potent performance package. The touring class had once again been turned upon its ear. Also available: GL1800 ABS. Drawing rave reviews and universal praise from industry experts and enthusiasts alike, the GL1800 enters its second season at full throttle. Also available: GL1800 ABS. The '03 Gold Wing continues its dominion over the luxury touring class with its perfect balance of high-performance and first-class features. Also available: GL1800 ABS. Seven brilliant colors highlight this year's Gold Wing line-up, offering perhaps the broadest palette yet. Also available: GL1800 ABS. Happy 30th birthday to you, Honda Gold Wing! Three decades of peerless luxury touring excellence are embodied in this year's specially badged 30th Anniversary commemorative edition. Also available: GL1800 ABS. This time there were some big changes and refinements. The GL1800 for 2006 came in four variations. Other changes included larger radiators and cooling fans, better rubbers between the engine guards and exhaust cowls, new rear trunk and saddlebag lights,facelifted meter panel and instruments, and bigger rear speaker pods. Four variations of the GL1800 as in 2006. ABS was now available on the top two models for 2007. The 2008 Goldwing model information was released earlier in the year than the traditional September and we had all read the fine print while the summer was still young. Models are the same as for 2007.